Everything in the universe has a vibration. All the rocks, trees, plants, minerals, animals and people. These vibrations are all measurable in hertz. Hertz is named after the scientist Heinrich Rudolf Hertz, who was the first physicist to prove the existence of electromagnetic waves. If everything in the Universe is energy, this means that without any exception, a rock will have a vibration (low) just as an apple will have a vibration (high). And vibration affects matter. Eating nutritious is important, but it seems that society today, including the consumer, medical community, educational institutions, the government and food markets are all ignoring one of the most important aspects of living: the value of foods in high vibration. The vibrational benefit of food is maximized when eating fresh fruits and vegetables straight off the plant, tree or vine. Foods shipped long distances lose their vibrational value. Why? Because they are picked before ripening so that the foods will ripen in your kitchen. This means that they didn’t get the sun required to maximize its vibrational quality. Therefore, it’s important to eat organic and local as much as possible, because the energy in the food will be in high vibration allowing the body to be light instead of dense. Furthermore it will reduce the carbon footprint since local food doesn’t require long distance shipping. Personally, I’ve noticed that many foods I buy at the local farmers markets will damage faster than the foods I buy in Whole Foods and it’s obvious why. The foods in the local farmers market are picked when ripe, meaning they contain the highest levels of vibrational content. This doesn’t mean that the food is not as good as the foods bought in stores. I just need to buy consciously and eat these foods sooner, and also know how to store them to keep them fresh the longest. In the common city life, a dense energy is achieved unconsciously due to the modern high stress and rat race lifestyles lived. The food choices are not high in water or vibration, filled with sodium content, bottled, canned or frozen and simply not good for you. The food choices offered on the majority of city corners are almost exclusively of a low density vibration. When eating organic food directly from the plant, the plant is rich in nutrients from the sun. The sun is key as it charges these foods to reach their maximum health and energetic benefit. Picking them ripe right off the tree or plant they are at their optimum vibrational levels. Most fast food and large grocery chains offer foods at a very low vibrational quality, thus adding density to the body. This of course contributes to sickness, obesity, stress, health issues and eventually death. A healthy human body operates at 62 to 72 hertz. By raising the vibration of the body, diseases, virus, fungi and bacteria cannot live. Not only this, but our bodies transcend to a more positve state; better emotions, more positive thought patterns, etc. It is no surprise that modern society is depressed, weighed down and sick, because the majority of the foods consumed are laced with low density. It is a good practice, and important to give thanks or bless your food before eating, and even while preparing it and cooking. Transmit love in any way to your food. This will also lift the vibration of foods. People are blown away by Masaru Emoto’s water tests that demonstrate how human consciousness has an effect on the molecular structure of water. His studies show that water takes on the resonance of energy which is directed at it, such as prayer and positive visualization. Since foods, specially foods with high water content, such as fruits and vegetables contain water molecules, we can attest that Dr. Emoto’s experiment also applies to our food. Saying a few simple words of gratitude for the food in front of you can have a very positive effect on you and your health. When eating; it’s also important to create an ambience of peacefulness. Light some candles, turn on quiet music, do not argue at the dinner table, eat food slowly and chew well, and give thanks for the bounty; this will enable proper digestion of the food. To find high vibrational foods, steer clear of the large supermarkets, or department stores offering supermarkets in them, as their aisles are primarily loaded with items for fast convenience and low vibrations. 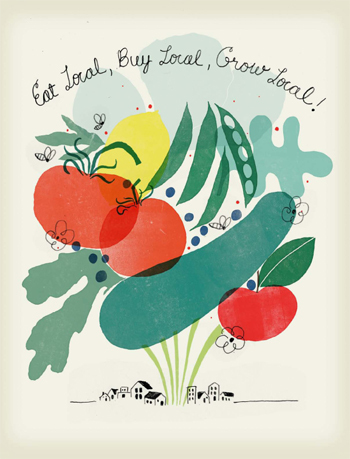 Or if you must shop here, try to buy organic and local as much as possible. Although harder to find and locate – depending on the city one lives in – health stores also have many products, which are mainly organic. It’s also very important to grow your own produce during the growing season, to optimize the nutritional and spiritual value of the food. The choice is clear: stay away from fast foods, heavy meats, processed food, large amounts of sodium and sugar in the diet; and head towards a leaner, higher vibrational diet . The results of this practice will most likely aid one in turning their life around by increasing spiritual, mental and physical gains to lead a better, more divinely driven existence. The results will be a lighter, less dense body; higher consciousness levels, a direct feed of intuition from one’s higher self, and living your life’s purpose.